Many of you have heard about the upcoming changes to the card processing standards known as EMV that will become the standard in the US on Oct 1st, 2015. This standard has been present in Europe for the past decade (which is where the EMV abbreviation comes from: Europay, Mastercard, and Visa). 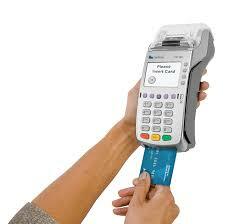 – The EMV standard only applies to retail, card present transactions. Those merchants that accept payment over the phone or online are not impacted. Those merchants that use a Point of Sale (POS) system need to follow up with the provider of their POS. – EMV is specific to the chips that are becoming ubiquitous in new credit cards. EMV is also known as Chip and PIN in Europe (and Canada) as the card readers read the chip and then the user puts in their PIN number. In the US we’ll be using a modified version called “Chip and Signature” as we are not required to enter a PIN but instead will continue to sign receipts for card present transactions. – All existing equipment that reads magnetic stripes on credit cards will continue to work. You simply won’t be able to read the embedded chip without new hardware. a) You accept a credit card that has the chip embedded, but you only read the magnetic stripe and don’t read the chip. This transactions turns out to be fraudulent where the card is used by someone other than the owner. The owner files a chargeback – you have no recourse if the chip was present and you didn’t read it. b) The same exact scenario as above, but the card was used by the legitimate owner and they file a chargeback. You still are able to fight that chargeback as you are now even though you didn’t read the chip. c) The same exact scenario as in a) above, but you do read the chip on the card because you have updated hardware. In this case you have the ability to contest the chargeback of this fraudulent transaction (because, presumably, you have a signature on a receipt that matches the card). Remember, chargebacks are not refunds. Chargebacks only occur when the cardholder contests that they didn’t receive goods or services that they were billed for. Bottom line, the only impact the new EMV standard has is for card present, swiped transactions where the card was used fraudulently. In these cases, if you read the chip on the card you have recourse, and if you don’t, you do not. If you don’t accept cards in a card present and swiped environment, EMV has no impact on your business. – Have I ever had a chargeback in the past, let alone one due to fraudulent behavior? You do not have to get new equipment as a result of the Oct 1st EMV standard, but you do need to understand the facts. If you feel that paying the $150-200 for a new terminal is worth your expense, then by all means let’s get you new equipment. If you don’t think it’s worth it right now, or you want to take a wait and see approach to whether your chargebacks increase, that is fine as well. We can always get you a new terminal later as well. If you want to upgrade your terminal, please respond to this email and we’ll get you the add-equipment form. The terminal will be sent to you directly, programmed and ready to go. Remember: If you use a POS (point of sale) system, you need to contact your POS provider to ensure that they are EMV compliant. We intentionally waited to send this news out to our clients, as there’s been a lot of misinformation and early adopters were paying too much for hardware. The dust is settling on the reality around EMV and prices have come down for hardware, so the time is right to move and still meet the Oct 1st deadline. Please let us know if you have any questions.